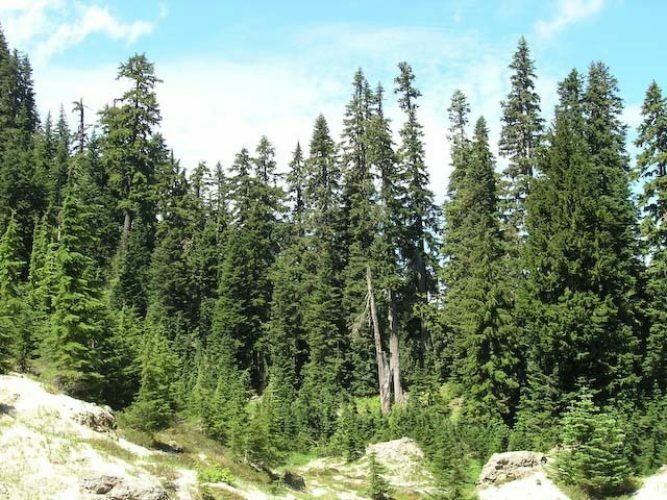 Abies amabilis, as described in 1839 by David Douglas (1798–1834) ex John Forbes (1799–1823), in Pinetum Woburnense, 125th edition, is commonly known as Pacific Silver fir, white fir, red fir, lovely fir, amabilis fir, Cascades fir; as well as sapin gracieux in the French language. 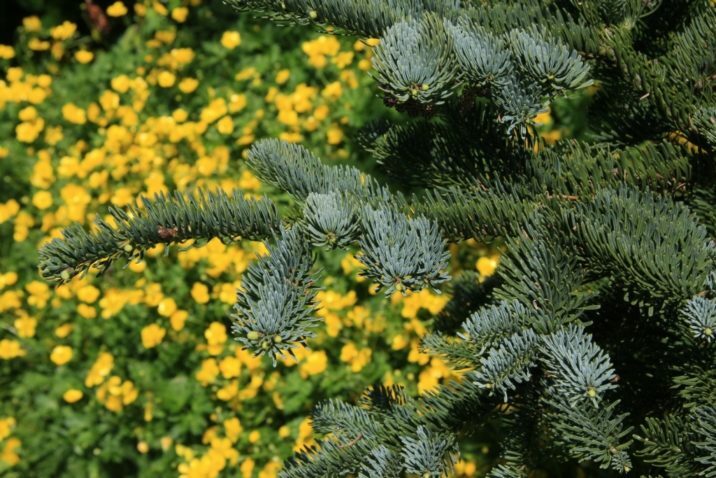 In the Latin language, "amabilis" translates into "lovely," well aptly described young trees of this species. Description. 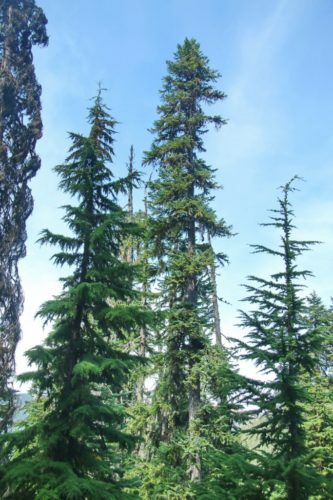 Pacific Silver fir is a large, evergreen, coniferous species of tree which grows to mature heights of 165 to 260 feet (50 - 80 m) tall, with a straight stem, and a globose, conical crown. Bark is smooth, furrowed only at the base. Branching is tiered, branching down to the base, particularly in open areas. Foliar buds are resinous and dark red in color. 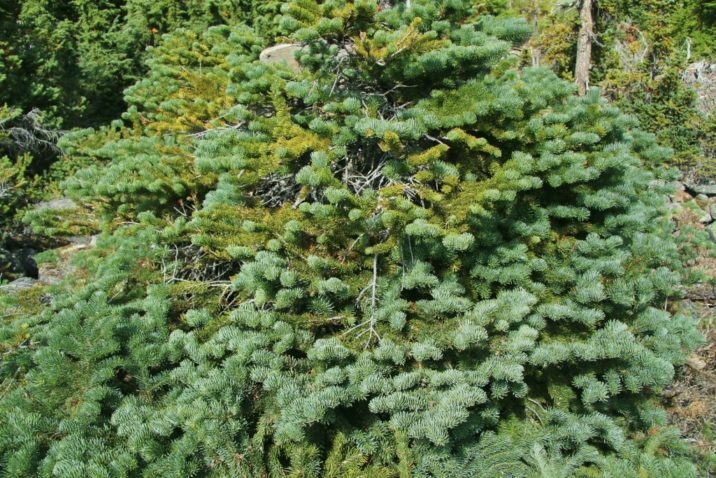 Branches are gray or yellowish-brown in color when young. 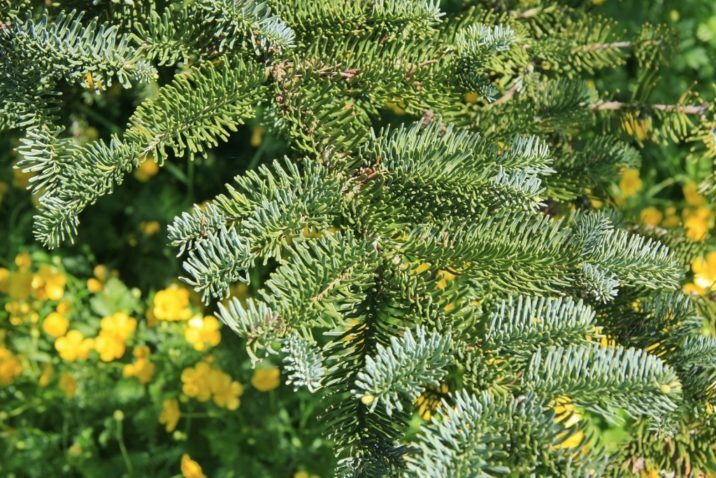 Leaves (needles) are very densely arranged, bristle-like above, with erect side rows, parted beneath (especially on the lower branches). Individual needles measure 0.8 to 1.2 inches (20 - 30 mm) long, by 0.08 inch (2 mm) thick, often widest over the middle, with a truncated or 2-pointed apex that is dark green and furrowed above, with 2 white stomatal bands beneath, each with 5 - 6 lines, with fragrance of oranges when crushed. 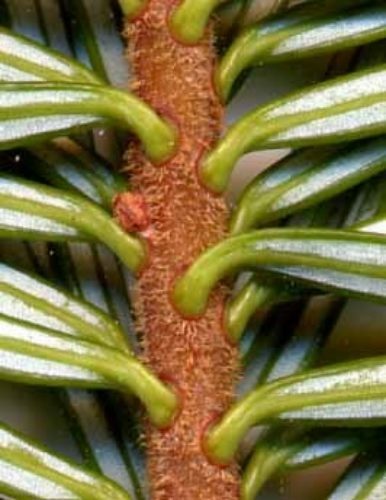 Needles of the uppermost branches often thicker, shorter and also with stomatal lines above. Seed scales, bract scales are not visible. Distribution. 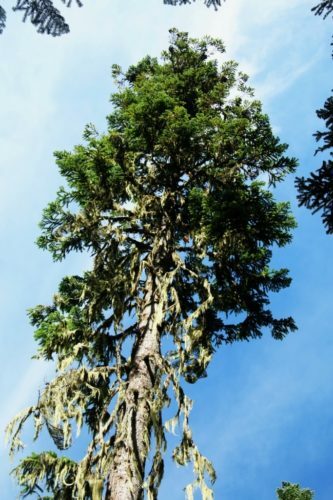 This species is native to the US — southeastern Alaska, western Washington and Oregon, and northwestern California. 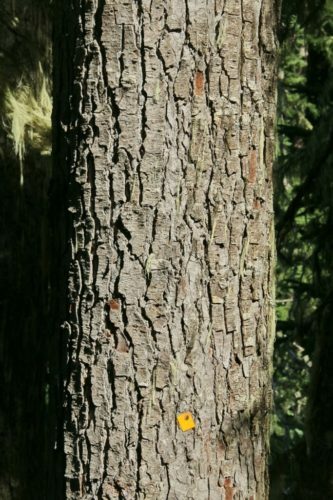 It is also native to Canada — western British Columbia. 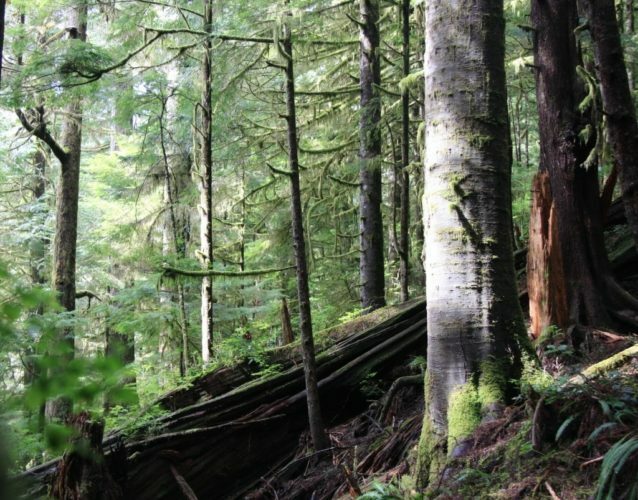 It grows at altitudes of sea level to 5,000 feet (1,500 m) of elevation in the north of the range, and 3,300 - 7,500 feet (1,000 – 2,300 m) elevation in the south of the range, always in temperate rain forests with relatively high precipitation and cool, humid summers. 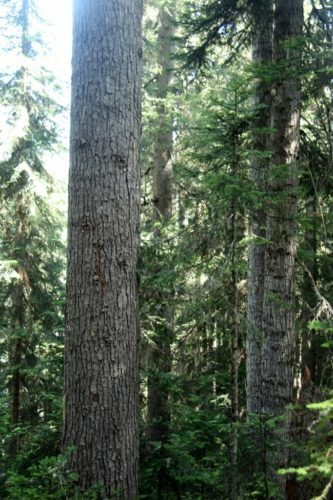 Common associate trees are Douglas fir. 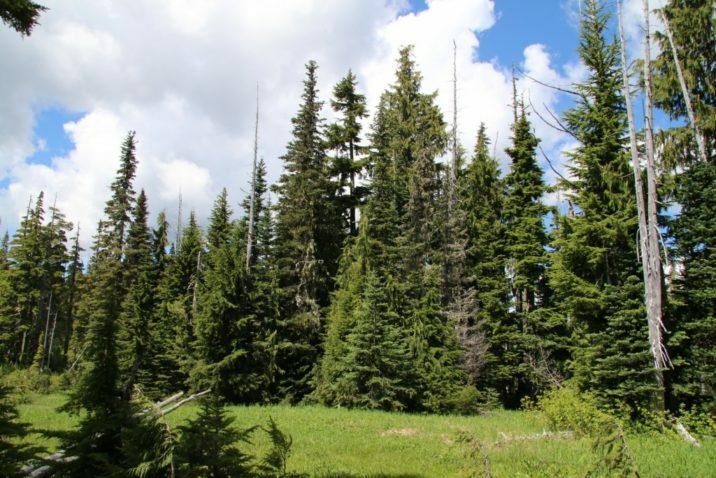 Tsuga mertensiana-Abies amabilis forest below Shark Peak, southern Washington Cascades. 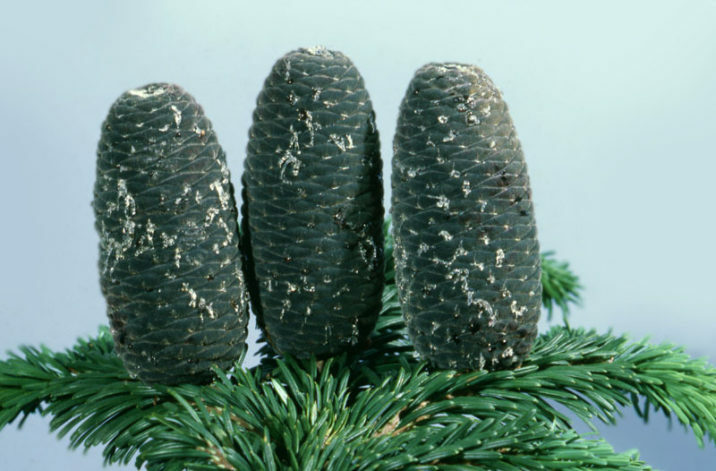 Abies amabilis — upright mature fragmenting cones. 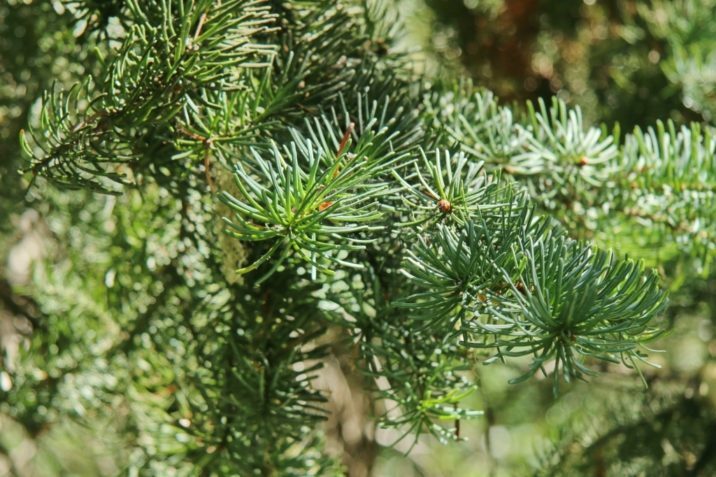 Picture provided by the American Conifer Society.